Its first smartwatch isn't the only thing Alcatel is talking about today. TCL, the Chinese company behind the brand, has also unveiled an upcoming line of smartphones called Pixi 3 - to succeed the original Pixi from 2013 and the Pixi 2 from last year, undoubtedly. 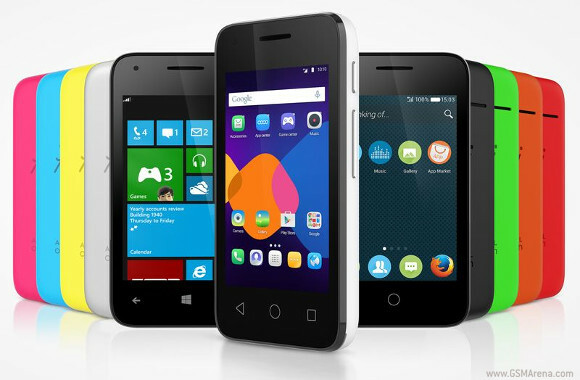 It comprises of four handsets, each with a different screen size : 3.5", 4", 4.5", and 5". The smallest of the bunch tops out at 3G connectivity, but the other three come with 4G LTE support built-in. The most interesting tidbit in Alcatel's otherwise detail-starved press release is that the Pixi 3 devices will be OS-agnostic, unlike the Pixi and Pixi 2 which ran 'just' Android. The new phones will thus be "compatible with three major operating systems: Firefox, Windows, and Android", according to the official press release. Unfortunately though, what Alcatel means by that isn't further explained. Since these are going to be affordable offerings, we do however assume we're more likely to see each size have three versions - one for each of the aforementioned operating systems. This seems more likely than loading all three operating systems on each handset. Either way, we're surely going to find out more about the Pixi 3 smartphones next week during CES. I bought the Alcatel OT PIXI 3 for an emergency backup phone. It was dirt cheap and now I know why. You can't find the stock firmware anywhere so now it's just a paperweight.